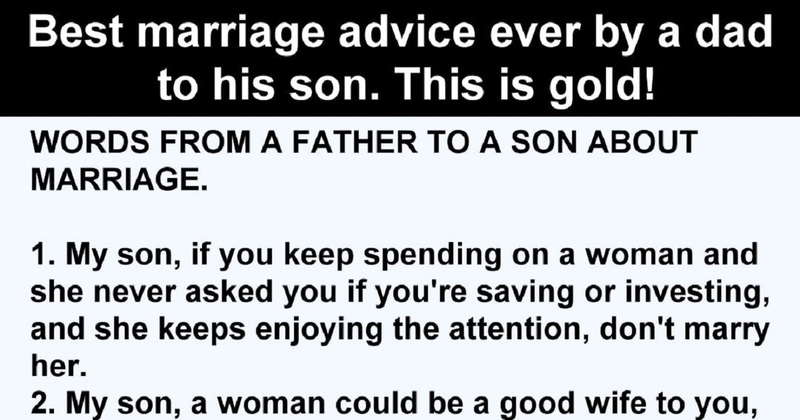 / Best Marriage Advice Ever By A Father To His Son: This Is Golden! When it comes to giving advice, marriage advice is probably the best one. You may ask why. Well, your husband or wife is the one who is supposed to be by your side until the end. Your spouse is the one who is there for you through good and bad times. They endure every failure, struggle, and hardship with you. They are with you for happiness, success, and growth. You are there for each other, you have each other’s backs, and you make a life together. As a partnership, marriage can be really amazing but only if you nurture it. When the rest of the world forgets about you, your spouse can give you stability, hope, and comfort. 1. Do not marry a woman that never asks if you are investing or saving something, but only enjoys everything you do for her. 2. Do not let a woman go if she can be a mother to your children, to you, and your family. 3. Never confine the position of your woman in the kitchen. Back in the days, people had farm-lands where women worked each day. 4. If you are the head of the house, you should not look into your wallet, but on your spouse’s face. 5. Let your spouse be in charge of your salary. When she is aware of the needs a house and a family have, it will be difficult to spend it. 6. You should never beat your wife because you do not want to live with a wounded woman. 7. Keep in mind that living a bachelor life while being married will soon make you single. 8. In the past, people had many wives and kids because they had many lands for farming. But, make sure to embrace your woman closely because today there is hardly any land for farming. 9. ”Meet me under the big tree” is nowadays “restaurants.” Remember that the closest thing your mother and I did was to embrace each other. 10. When you earn a lot of money, do not spend it on other women who have no idea what you have done to get there. Spend it on your wife that has been by your side from the very beginning. 11. I used to throw stones or whistle under the window of your mother because I missed her very much, not because I wanted to be intimate with her. 12. If your woman is changed, there is something that you have stopped doing. 13. A woman that will not be by your side when you have little, should not enjoy your riches! Your mom was with me even when I had only a bike. 14. Never compare your woman with others. Has she ever compared you to other men? 15. If your wife claims to be a feminist and to have the same rights as you, then, divide the bills, and tell her to pay one part. 16. Back in the day, women had prestige. So, if your wife was not a virgin when you met her, do not blame her. 17. Do not make the mistake I did. I did not send your sisters to school because I thought that they may not be able to extend my family. Women can be successful, so send your daughters to school. 18. Even though your mother almost tore a cloth I was wearing due to anger, I never raised a hand to her. And, I am proud of that! 19. Back in the day, women had more of natural beauty, but they also did not expose their body parts like women nowadays do. 20. Try to deal with your marriage problems without consulting us all the time, we are not interested in your marriage. 21. Help your woman achieve her dreams. I bought your mother a sewing machine. 22. Never forget your parents because your kids should take care of you when you grow old. 23. Be thankful for what you have. Pray with your family because you do not know what tomorrow may bring.